The Versailles Knights of Columbus and Versailles Lions club present a check to the Council of Churches food pantry. Both service organizations would like to thank the Versailles and surrounding communities for their support of the Benefit Breakfast held on Dec. 2, 2018 at the Versailles Knights of Columbus Hall. This is the 28th year for this event benefiting the food pantry. Much appreciation to all of the volunteers who lent a hand in making this event successful. Next year's breakfast will be December 1, 2019. 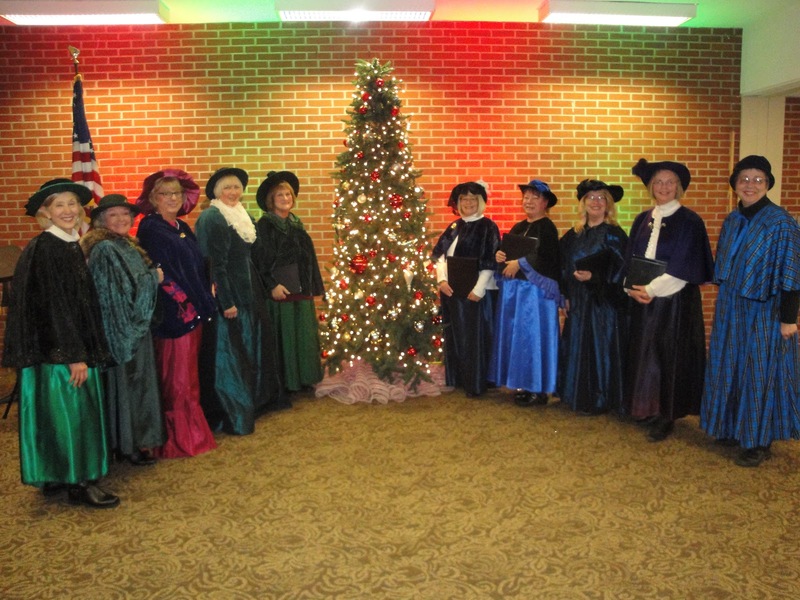 Greenville BPW Club Celebrates Christmas! Greenville, OH.- The Melody Line chorus group entertained the Greenville Business & Professional Women’s (BPW) Club at the Christmas meeting held on December 13th. The group is comprised of pianist: Terri Fryman and singers: Marilyn Light, Becky Hartnagle, Kathy Douds, Leigh Fletcher, Cathy Cornell. 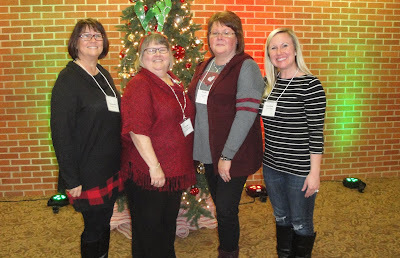 Debbie Weyrick, Mary Kell, Brenda McCoy and Ann White . 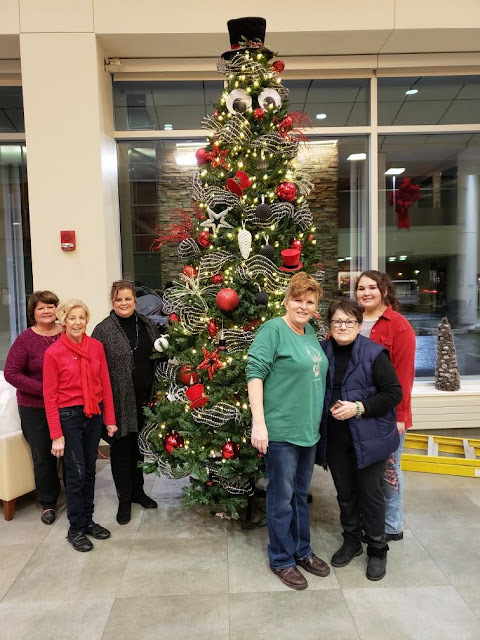 The meeting was hosted by the Christmas Committee members: Vicki Cost, Lindsey Gehret, Leigh Fletcher, Desteni Mason, Kristina Heath and Brenda Miller. It was held at the Brethren Retirement Center. This year the local BPW group collected gently used stuffed toys as well as paper products, shampoo and conditioner, Tide laundry soap, kitchen trash can and bags, diapers, children and family oriented videos and DVD’s and cash donations for the Darke County Shelter from Violence. Shelter Director Annie Sonner was present to accept all donations and expressed her thanks for the club’s generosity. Guest Night Chair Debbie Niekamp held the Super Raffle drawing that was introduced at the ‘What a Girl Wants’ guest night meeting in October. The winners were: Betty Hartzell – 2 Night Stay-StoneHead Ridge Cabin, Brown Co. IN. 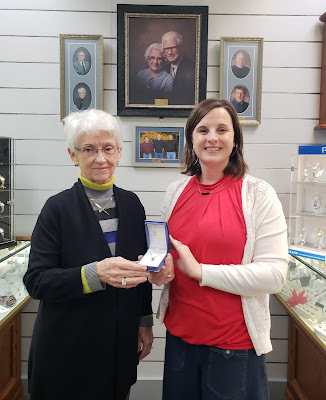 (Deb Niekamp); Kathy O’Dell - Frederic Duclos Sterling Silver Necklace and Earrings (Wieland Jewelers); Sue Newland - 39” Element Smart TV (Your Expert Mortgage Team – John & Kristina Heath); Eileen Litchfield - Suds in a Bucket Cleaning Svc. 3 Hr. (Loure Bohn); and Carey Driscoll - 3 Speed Hand Blender (KitchenAid Experience). 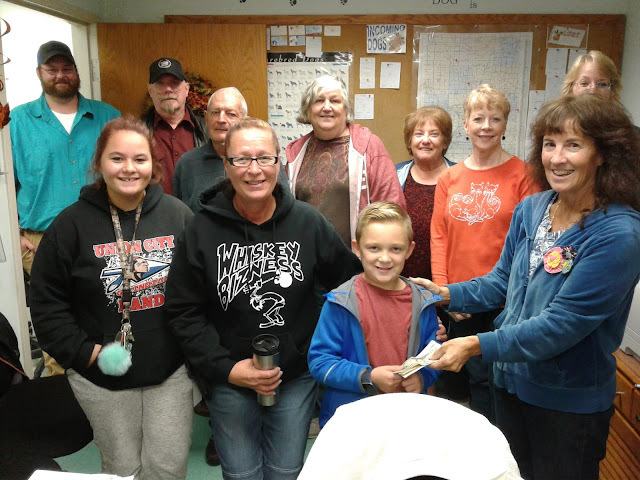 Niekamp thanked all businesses for their support and donations to the Super Raffle Drawing. Proceeds go to granting scholarships to the young women of Darke County. The Greenville BPW Club’s mission is to achieve equity for all women in the workplace through advocacy, education, and information. The Club meets the second Thursday of every month for a dinner meeting. Those interested in learning more about the club can contact Membership Chair Sonya Crist at 937/423-3657 or sonyacrist@gmail.com. 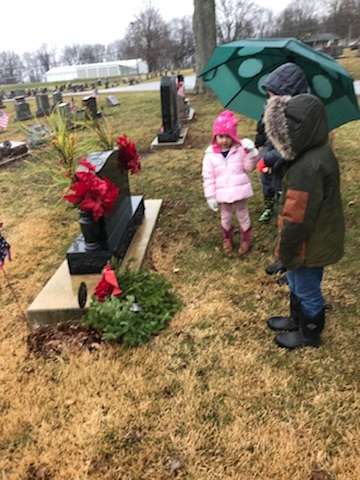 Despite the rain, over 30 volunteers attended including Darke County Commissioner Matt Aultman and Greenville Union Cemetery Phillip Strait. The masters of ceremony for the event were Regent Debbie Nisonger and Chris Nehring. DAR Chaplain Karen Burkett led everyone in prayer. During the ceremony, a wreath was laid at the grave of American Revolutionary War soldier William Dugan by chapter members Caroline Petitjean and Brenda Arnett. Our own chapter member and Gold Star Mother Sandra King had the honors of laying the ceremonial wreath on behalf of POWs/MIAs. Guest speakers were Ben Thaeler, District Director, Office of Congressman Warren Davidson and WAA Honor Fleet participate Richard Grow. Also included in the ceremony were the Versailles Color Guard, buglar Starranne Wise-US Army retired, Greenville ROTC Color Guard and local Boy Scout Troops 134 & 343 who lead the Pledge of Allegiance. Fort GreeneVille DAR would like to thank all the individual donors and sponsors. Sponsors included Zechar Bailey Funeral Home, Dave Knapp Ford, Second National Bank, Dr. Stentzel, American Legion Post 140 Auxillary, Greenville Masonic Lodge 143, Greenville Memorial VFW Post 7262 and St. Paul United Church of Christ. Fort GreeneVille DAR would also like to thank Greg Peck Sound Systems, Treaty City Industries employees, Greenville Union Cemetery, Township Trustees, and volunteers. As the buses moved, much to everyone’s amazement, stood six brand new ambulances for the Spirit family of professionals to now service its patients with. six power cots manufactured by Stryker. Greenville, OH – The true “Spirit” of Christmas came early this year for a Greenville based ambulance company. 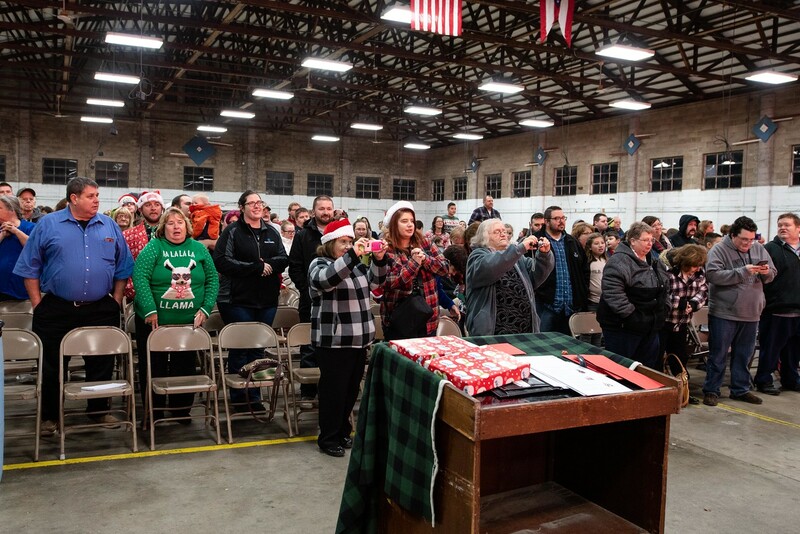 During the annual employee Christmas party held this past Sunday, Spirit Medical Transport, LLC, President/CEO Brian K. Hathaway opened the Spirit 2018 Christmas party with a speech that no one present will likely ever forget. As the crowd entered, they were guided to rows of chairs that had been set up in front of two buses that were wrapped in Christmas paper and a banner in the middle the read “Spirit’s North Pole.” To ensure they couldn’t see anything behind the buses, caution tape prevented them from getting any viewing advantages. While taking a seat, those in attendance began to ponder what all the hype was about. Then, Hathaway began to share why employees and their families had been invited to this special place. The president explained that the employees said they needed more cardiac monitors that have “all the bells and whistles.” He asked Santa if he thought he could deliver. Santa pondered the question a few seconds and then whispered in Hathaway’s ear. Hathaway smiled and said that six additional cardiac monitors had been ordered for the benefit of patient care. Hathaway told those in attendance that many EMS employees had expressed a desire to have powered ambulance stretchers in the ambulances to help lift the ever growing, morbidly obese population. He said he had sought bids from both Ferno and Stryker. He then asked the crowd if they’d like to know what was sitting behind the bus at the North Pole. 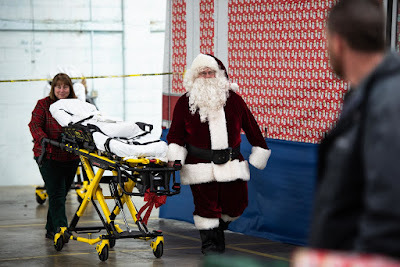 The crowd yelled out, “Yes,” and Santa went behind the bus and escorted out six brand new power stretchers from Stryker that have the capacity to lift someone weighing up to 700-pounds. The crowd stood with applause. Then, Hathaway said after agreeing to purchase from Stryker, the Ferno representative continued contact with him and gave the company a deal he couldn’t resist. He asked the crowd if they liked power cots. They replied with an astounding “yes.” Hathaway asked Santa to go check his sleigh for any additional power cots “you might have sitting around.” Within seconds, the elves from Spirit’s North Pole brought out six additional Ferno power cots. The crowd again roared with applause. While addressing the crowd, he shared information about a report that two members of his management team put together this past summer about the available savings in parts and fuel associated with operating the new Ford Transit ambulances. Hathaway said he took the information to Greenville Federal and asked them about potential lending opportunities, as the purchase of the committee’s three recommended ambulances would supersede the available line of credit. In televisions true ‘Extreme Makeover’ fashion, the crowd began to chant “move that bus…move that bus.” In response, Santa jumped into the driver’s seat of one bus and his elf another. As the curtain dropped and the buses began to move, six sets of emergency flashing lights began to light up the coliseum as the crowd took view of six brand new McCoy-Miller Ford Transit ambulances. While some in the crowd cheered, others began to shed tears of joy. Others approached Hathaway and co-owner Aaron Guthrie giving them hugs for a Christmas party they’ll never forget. 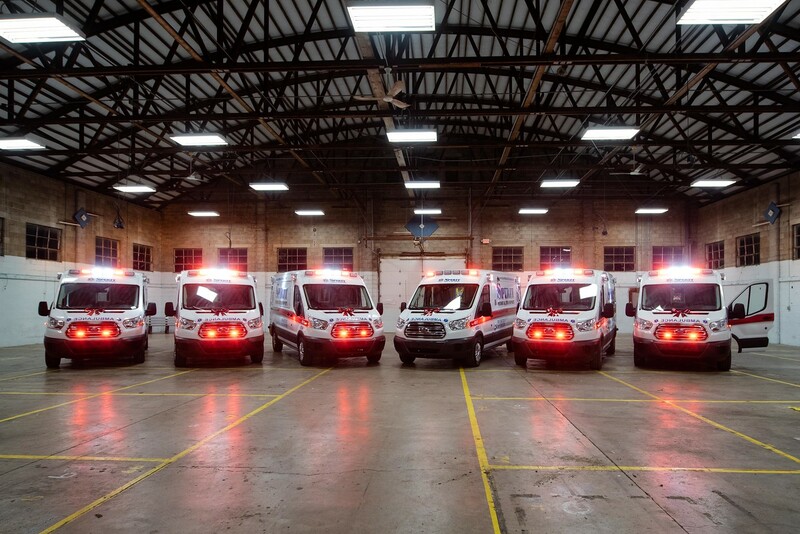 In the nearly 12 years Spirit has been in business, it’s the first time the company has opted to buy new versus used ambulances. Hathaway said only five company employees, two of which are his parents, knew about the big surprise. Hathaway said he and the other five spent countless hours stocking each of the six ambulances to make sure they were ready for inspection by the Ohio Division of EMS, days before the company Christmas party. This past Monday, all six ambulances were on the roads of western Ohio and eastern Indiana serving those in the geographical area Spirit covers. Spirit Medical Transport, LLC, employs over 100 people and serves all of western Ohio and Eastern Indiana with stations in Greenville, Celina, Van Wert, Sidney, and Liberty, IN. All wrapped in bows, six Stryker power cots sit at the Spirit North Pole, one of many shocking surprises during the company’s recent Christmas celebration. Dave Snider brings out one of the six power cots manufactured by Ferno of Wilmington, Ohio. Six Ferno power cots sit at the Spirit North Pole, just one of many shocking gifts found in Santa’s sleigh at the recent Spirit Medical Transport, LLC, Christmas celebration. 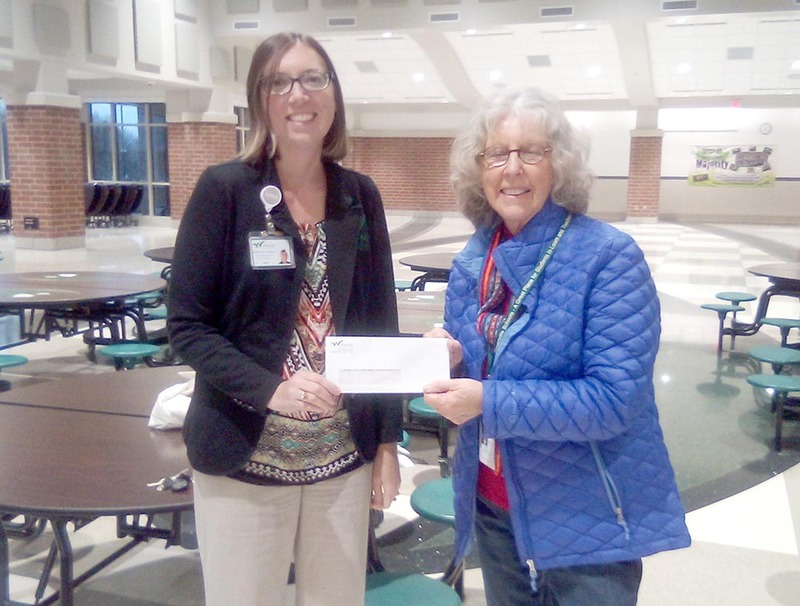 Lauren Henry, left, Director of the Wayne HealthCare Foundation, presents a check to Kay Sloat, Assistant Program Coordinator for Empowering Darke County Youth. This is the Foundation’s second year of support. 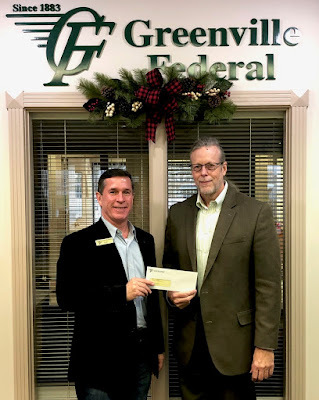 GREENVILLE – The Wayne HealthCare Foundation continued its support of Empowering programs recently with a donation. This is the second year the foundation has supported Empowering’s goal to help young people struggling with their academics. Foundation Director, Lauren Henry, presented the check to Empowering Assistant Program Coordinator Kay Sloat following a recent After School Program tutoring session at Greenville Elementary and Middle School. The Wayne HealthCare Foundation was established in 2007 to aid in the enhancement of community education and wellness. Empowering Darke County Youth began its third After School Tutoring Program in September. Over one hundred students have taken advantage of the opportunity and have improved in the fundamental areas of reading and comprehension, and math. The fall session has just wrapped up for the Christmas break having completed nearly 2,500 student contact hours. For more information contact Empowering at empoweringyouth101@gmail.com or on Facebook. Donations are gratefully accepted. Mail to P.O. Box 1113, Greenville 45331. Darke County Center for the arts recognizes Wieland Jewelers and Dean & Arlene Bankson for their generous donation to DCCA's Ruby Year Celebration. A custom ruby & diamond necklace was designed by Dean Bankson specifically for DCCA as the Ruby Giveaway Grand Prize. 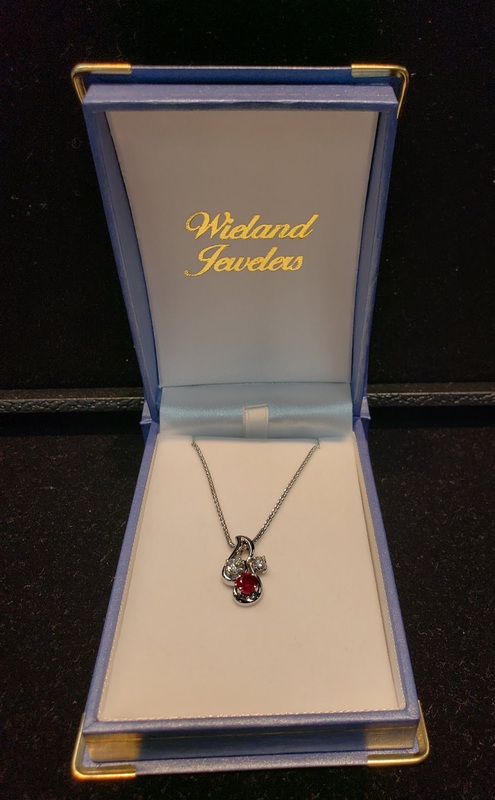 "DCCA is grateful for Wieland Jewelers donation and sponsorship of the 2018-2019 Ruby Celebration Season at the Impresario Level, DCCA’s highest level of sponsorship," shared Andrea Jordan, DCCA Executive Director. "The necklace is unique and a beautiful expression of art, just like our organization. What a wonderful way to celebrate DCCA's 40th Season," concluded Jordan. The ruby & diamond necklace is just under a karat in gem weight featuring a stunning ruby offset by two diamonds, in an elegant 14K white gold setting, on a 20 inch wheat chain. You can get a glimpse of this beauty in person, as it will be on display at Wieland Jewelers, in downtown Greenville. Expanding on the Ruby Celebration Season theme 2018-2019 DCCA Artist Series subscribers have been entered to win a "Ruby" themed gift for each Artist Series event. So far, giveaways have included 40 red roses from Helen's Flowers and a bottle of red wine handpicked by Ted & Diana Abney from The Bistro Off Broadway. The Grand Prize Ruby Giveaway will be drawn at the final DCCA season performance of the Toledo Symphony Orchestra on Saturday, May 11th after “A Ruby Celebration,” a concert created by Toledo Symphony Orchestra especially for Darke County Center for the Arts. The performance provides a festive conclusion to a glittering season, featuring songstress Joan Ellison performing classic American songs by Gershwin as well as standards made popular by Judy Garland. Darke County Center for the Arts presents and promotes performing and fine arts encouraging cultural enrichment. For more information of upcoming DCCA events or to purchase tickets contact the DCCA office at (937) 547-0908 or visit their website at www.DarkeCountyArts.org. On January 4th, 2019 Mississinawa Valley will be hosting the annual induction into the Blackhawk Athletic Hall of Fame. The ceremony will be held before the start of the varsity basketball game between Mississinawa Valley and Newton. This year’s inductees are Dane Blumenstock and Ryan Rehmert. Dane Blumenstock is son of Craig Blumenstock and Lonni Neargarder. Dane was a member of the class of 2014, he participated in basketball, football and baseball. He earned four letters in basketball and three in both football and baseball. Dane excelled in basketball during his time at the Valley. In 2012-13, he was named All Tournament team at the Jet Holiday tournament and Associated Press All Ohio Honorable Mention. In 2014 Dane received Associated Press All Ohio again, and was recognized by state representative Jim Buchy. Dane is a member of the 1,000 point club and received 1st Team All CCC in 2013 and 2014. After high school Dane went to Wilmington College, where he majored in Business Administration and played basketball for two years. While playing for the Quakers, Dane won the Herman Madness Dunk contest in both his seasons. He graduated from WC in 2018 and now resides in Union City, IN. Currently Dane works for Astral Industries in Lynn, Indiana and is working towards a sales position within the company. Ryan Rehmert is the son of Curt and Melissa Rehmert. Ryan was a member of the class of 2013, he participated in golf and basketball. While at MV, Ryan earned four varsity letters in each of his respective sports. He excelled in golf earning many titles that include: 1st Team All CCC four years, Conference Champ ‘11 and ‘12, Darke County Player of the Year ‘11 and ‘12, four year District Qualifier, and Sectional Champion in 2011. During his years on the golf course for the Blackhawks Ryan earned a 36.2 nine hole average. His nine hole low score was a 33, while his low score for eighteen was an impressive 74. Ryan now resides in Union City, OH and works as a Customer Account Representative at Rent-a-Center in Greenville. Please join us for the celebration of the induction of Dane and Ryan into the Blackhawk Hall of Fame on January 4th, before the start of the Varsity contest between Mississinawa Valley and Newton. The Darke County Historical Society and the Garst Museum’s mission is to collect, preserve, exhibit, study, and interpret materials relating to the history and culture of Darke County, Ohio, as it represents a crossroads of the American experience. The DCHS operates the Garst Museum in Greenville, Ohio, and its 35,000-square-foot campus houses over 300,000 artifacts. Permanent exhibitions of national significance include the National Annie Oakley Center, the Treaty of Greenville, Lowell Thomas, Ohio Native Americans, and the multi-racial settlement of Longtown. For more information about the award-winning Garst Museum, see www.garstmuseum.org. If you like subs and brownies and you also like to help local cancer patients, the Cancer Association of Darke County would like your help with this new fundraiser. You can order subs and/or brownies now at a good price and pick them up in February. The subs sell for $5 or $5.50 and the brownies are $1. The proceeds will be used to help local cancer patients. The orders must be in by January 16, 2019 and can be picked up at First Assembly of God, 7219 St. Rt. 118, Greenville, Ohio, on February 9 from 1-3 pm. You can get your order form by stopping in at the cancer office at 1111 Sweitzer Street in the Wayne Cancer Center, or by emailing director@cadcinfo.org, or calling the office at 548-9960 and let us know where you want the form sent. The cancer center will be closed from December 22 through January 6, so please contact the office as soon as possible if you want to help with this project. The Miami Valley Career Technology Center (MVCTC) Eye Care/Ophthalmic Assistant Program held its graduation ceremony in the MVCTC Student Activity Center on December 7, 2018. Englewood, Ohio – The Miami Valley Career Technology Center (MVCTC) Eye Care/Ophthalmic Assistant Program held its graduation ceremony in the MVCTC Student Activity Center on December 7, 2018. The Center was full of family and friends there to support the graduates in attendance. Multiple faculty and staff were also in attendance to congratulate the graduates on successful completion of the rigorous program. The high demand for ophthalmic assistants, results in a nearly 100% job placement rate. Ultimately the students graduate from the program with the ability to enter the ophthalmic workforce at a competitive salary/wage. Recent graduates have obtained positions with a starting wage close to $20/hour and an opportunity for a raise once they obtain their Certified Ophthalmic Assistant (COA) credential. For more information about MVCTC Adult Education programs, please visit www.mvctc.com/AE. The Greenville Schools Foundation continues to support Greenville students by awarding grants to district leaders to fund projects and purchases that benefit a wide variety of student activities. The 500 Club raffle, going on now for the fourth year in a row offers three opportunities to win each month – all for a ticket costing $10.00. Proceeds from the sale of tickets go directly to help make these extra student activities possible. There are still plenty (15) of chances to win! 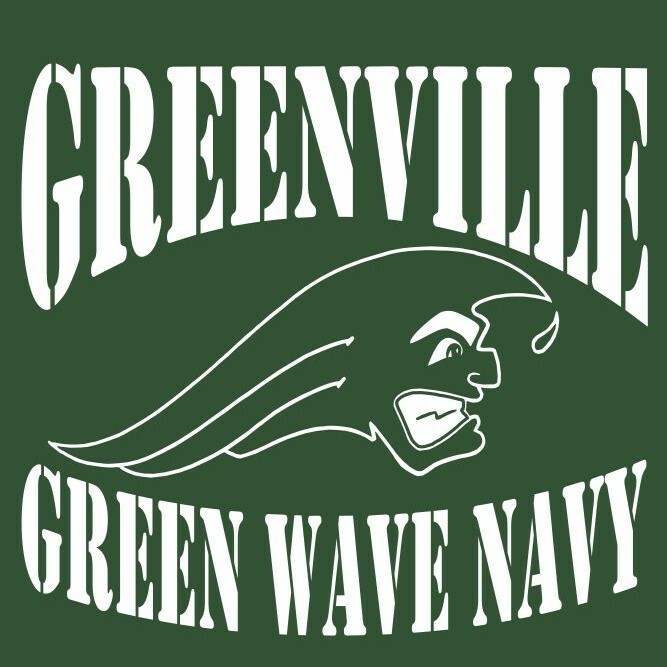 You help support Greenville students and win cash by calling 548-9895 or 548-1530. 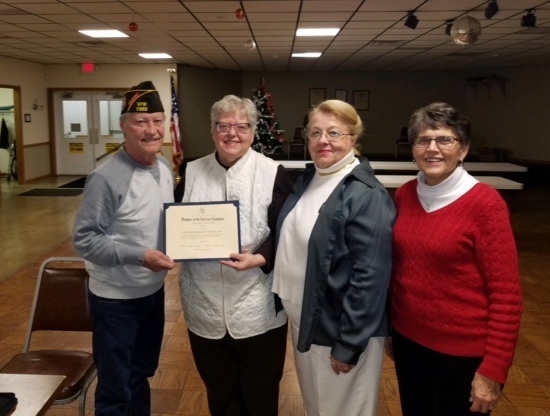 Fort GreeneVille chapter DAR recently awarded a certificate to the Greenville VFW Post 7262. The certificate was awarded for their continuous support to the various Veteran/military related projects that Fort GreeneVille DAR has done in the past and currently. Pictured: Post 7262 Commander Ron Mills, Vice Regent Brenda Arnett, Karen Burkett and Mary Jane Dietrich. Fort GreeneVille Daughters of the American Revolution decorated a Christmas tree in the military room at the Garst Museum for the annual Holiday Open House. 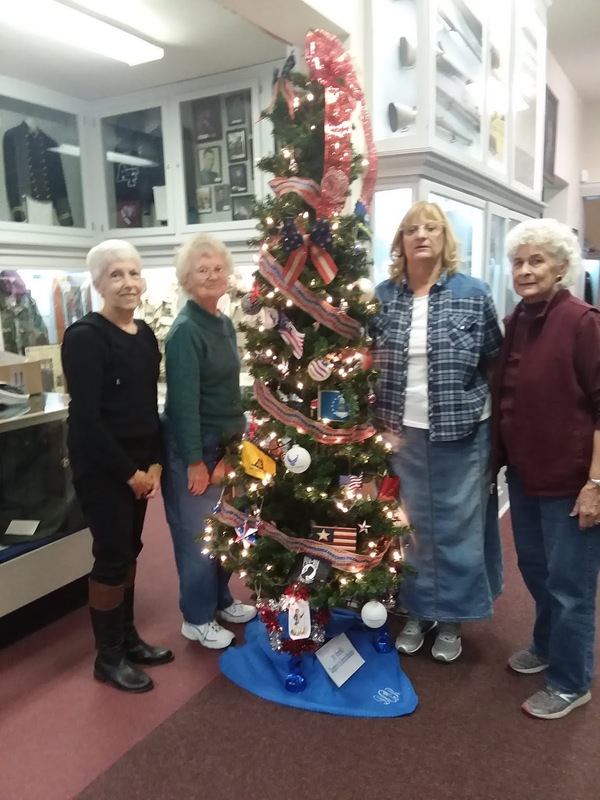 Members decorating were Corrinne Zwiesler, Caroline Petitjean, Sandra King and Helen Wright. Tickets Available for New Year’s Eve Bash! 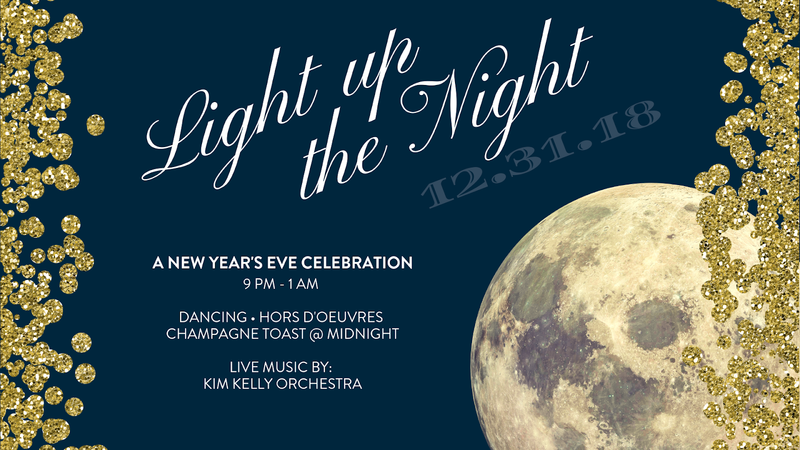 Tickets are available now for this New Year’s Eve party that will feature a 17 piece band, delicious hors d'oeuvres, and a complimentary glass of champagne to toast the new year. GREENVILLE, Ohio - Ring in the new year in style and Light up the Night at a glittering New Year's Eve Celebration! Dress up in your finest threads and dance the night away at this fabulous party featuring live music, delicious hors d'oeuvres, fun party favors, midnight snacks, and a complimentary glass of champagne to toast the new year. Throughout the night there will be chances to win prizes, signature cocktails at the fully stocked cash bar, and a photobooth for capturing memories! The musical entertainment for this event will feature the Kim Kelly Orchestra, a 17 piece band based out of Dayton, Ohio and offering a wide selection of styles ranging from big band/swing, classic & contemporary rock, latin, ballads, modern pop, and broadway/show selections. 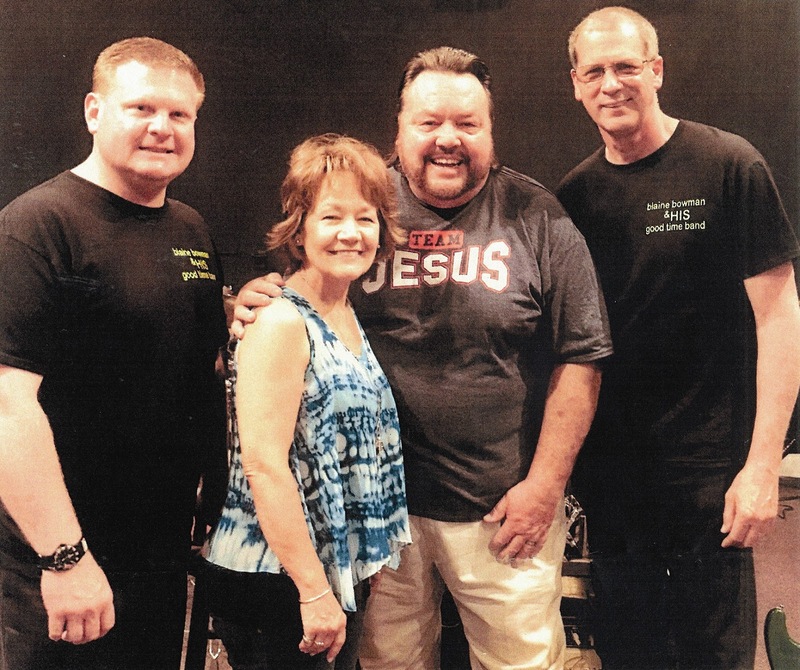 Kim Kelly and his orchestra primarily play to private and public audiences in the Tri-State area (Ohio, Kentucky, and Indiana) but routinely travel throughout the United States for clients that recognize and want the very best. Their most recognizable out-of-state event was a Super Bowl Gala for the Dallas Cowboys. The variety of sound brought by the KKO is sure to make this a memorable evening and a swinging start to 2019! Tickets for this entertainment-filled evening are $50 each, $80 per couple, or $300 for a table of eight. You can purchase tickets online or at the Main Street Greenville office (located in the Welcome Center at 421 S. Broadway). Tickets can be purchased online through Eventbrite.com. Online ticket sales are subject to an additional processing fee. All proceeds benefit Main Street Greenville, a non-profit organization dedicated to revitalizing downtown Greenville. If you are interested in purchasing tickets or have questions, please contact Crysta at 937-548-4998 or info@mainstreetgreenville.org. Main Street Greenville would like to thank the Champagne Champion level sponsors for this event, Family Health Services and Wayne HealthCare. 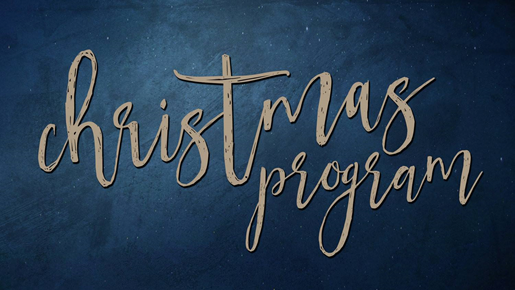 Join Beamsville Christian Church for our Family Christmas Program on Sunday, December 23rd at 10:30 AM. Our Christmas Worship musical focuses on “The King is Here”. Family Christmas Eve Candle Light Service on Monday, December 24th at 10:00 PM. This special service focuses our attention to our resurrected King. During our service we will worship in song, hear the birth story of our Savior, candle lighting, & celebrating as the body of Christ. Please contact Pastor Steve at 937-547-0009 for any additional information. Come on in to the Arcanum Public Library for some quiet time during this busy time of the year. Spend some time browsing on the computers, make copies of Christmas letters and pictures, and stock up on books and movies for snow days and school breaks. Come in to enjoy the Holiday décor or to find a quiet place to read and relax. Kids can pick up Holiday- themed coloring pages and activity sheets. The library is giving away a Kindle Fire to one lucky person! Patrons age 16 and up can enter the coloring contest for the Kindle. The winner will be chosen at random from the entries. Children under 16 can enter a coloring contest to win a “Holiday Happiness” jar filled with goodies. Come on in to get your coloring sheet. The annual Christmas craft night with Santa has been scheduled for Tuesday, December 18 from 6:00 – 7:30. There will be plenty of crafts for kids to make at this drop-in event. Santa will be on hand for pictures. There will be a winter reading challenge for adults starting in January. More information will be available toward the end of the month. Also in January, Versailles Winery will be coming to present an informative program all about wine. The presentation will be on Thursday, the 24th at 6:30. Class size is limited for this program, so be sure to call or drop in to sign up. The library would like to remind patrons it will be closed on December 24 and 25, and on December 31 and January 1.
presented her award by West Building Principal, Ms. Natasha Norvell. 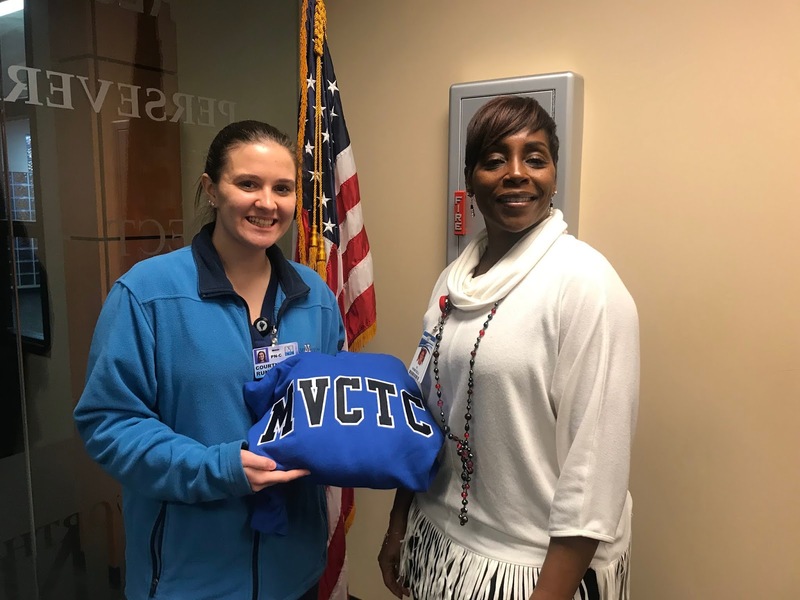 Englewood, Ohio – During the 2018-2019 school year, Miami Valley Career Technology Center (MVCTC) will introduce a new student recognition program to encourage the Choose Kindness Campaign started in April of 2018. The new MVCTC Integrity Award consists of “Caught Being Kind” cards that are awarded to students who are observed demonstrating kindness to other students. The “Caught Being Kind” cards are issued by any MVCTC staff member who observes a random act of kindness and wishes to acknowledge and recognize the student for their kindness/character. Students receiving a “Caught Being Kind” card put their name on one half of the card and deposit it in the Integrity Award box in each building’s front office. The other half of the card should be kept by the student to take home to share with family. Each month a drawing is held awarding one lucky “Caught Being Kind” recipient with the MVCTC Integrity Award for each building. The winners receive an MVCTC hooded sweatshirt, are recognized as a monthly Integrity Award winner on social media, the MVCTC website, and a special bulletin board in each building. The goal is to support and reinforce a culture of kindness by recognizing and rewarding random acts of kindness by MVCTC students. Jacob Bowling (Auto Services student from Northmont). Jacob was presented his award by East Building Principal, Mr. Dale Winner. Khali Books (Criminal Justice student from Vandalia). Khali was presented his award by West Building Principal, Ms. Natasha Norvell. Courtney Runkel (Pre-Nursing student from Tri-Village). Courtney was presented her award by West Building Principal, Ms. Natasha Norvell. 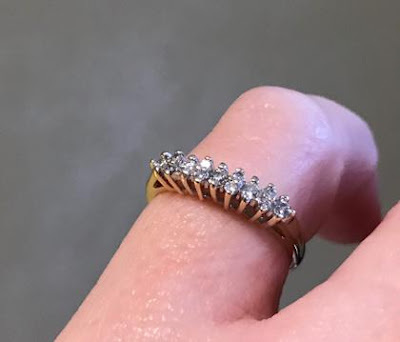 MARIA STEIN, Ohio (December 6, 2018) – The Maria Stein Shrine of the Holy Relics is hosting a diamond ring raffle, in which all proceeds will benefit the operational costs of the Shrine. 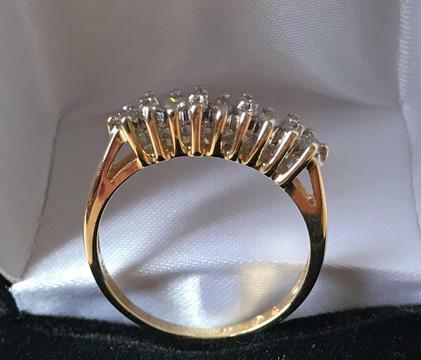 The ring was donated by an anonymous supporter and is valued at $750, based on a certified appraisal from Jones Jeweler in Celina. The Shrine is selling the tickets for $20.00. They can be purchased through their website at mariasteinshrine.org under “Support the Ministry” or in the Pilgrim Gift Shop, where the ring is on display. “Because this is a fundraiser, we are hoping to sell 150 tickets and will hold the raffle when that goal is met” added Russell. The Ladybug Garden Club selected three lucky business winners in Downtown Greenville for the 2018 Christmas Outstanding window displays. Handmade decorations was a high priority in selecting the December Christmas winners. The Bread of Life Bookstore received special recognition for their Outstanding Christmas window with a jolly handmade Snowman made by the Denlinger family. 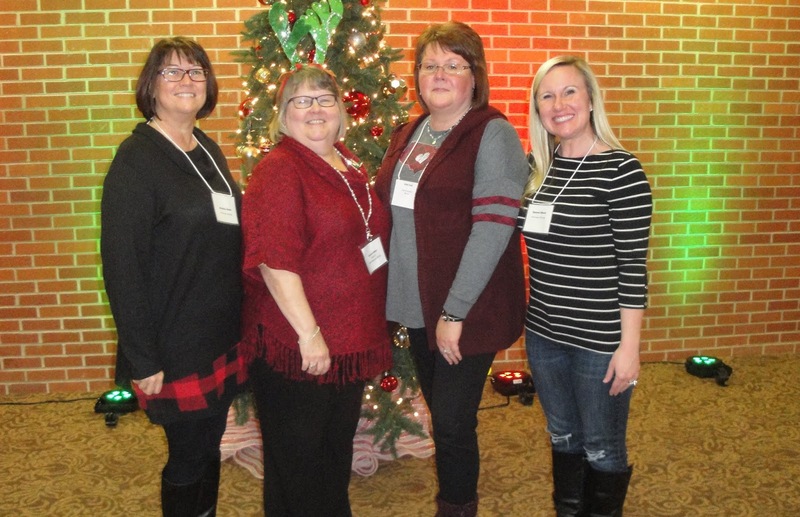 Shown l-r Ann Fields, Michelle Raffel, Heather Denlinger, Ladybug member Angela Beumer with the Bread of Life owner Julie Strait, and Ladybug Beautification chairman Lisa Marcum and Sherri Jones. The KitchenAid Experience was chosen Outstanding for the special passion in recreating a globe owned by manager Gloria Keller-Brinley. The globe was captured in the image art work by Michael Glass. Making the presentation was Ladybug member Lisa Marcum to Gloria Keller-Brinley, Angela Beumer and Sherri Jones. The handmade ornaments of dresses, tops and jewelry on a pink Christmas tree gave Kirstin Berghoff, owner and manager of Sadie Grace Boutique, the Christmas Community Beautification Award for outstanding achievement in design and maintenance of Commercial property and community beautification in Christmas decorating. Shown is Ladybug member Lisa Marcum, Kirstin Berghoff of Sadie Grace and Beautification committee members Sherri Jones and Angela Beumer. 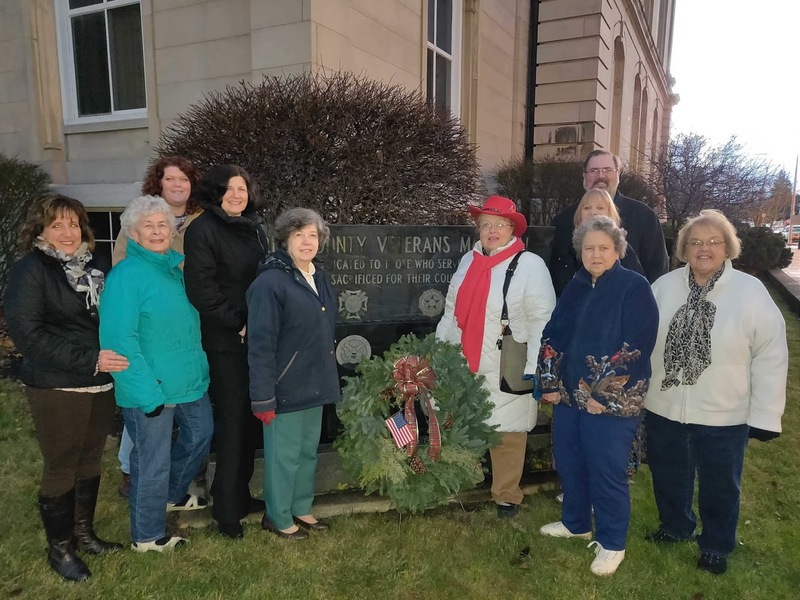 Fort GreeneVille chapter had a Christmas wreath dedication at the Darke County Veterans Memorial marker at the Darke County Courthouse. The wreath is in honor of all Darke County Veterans and active duty military. The wreath was purchased from the Ladybug Garden Club. Arcanum Faith United Methodist Church is participating in Angel Tree, a program of Prison Fellowship. This mission project reaches out to the children of prisoners and their families with the love of Christ at Christmas time. The Angle Tree project connects a child with their parent behind bars and offers joy and hope to a prisoner’s family. Church members contact the families and buys and delivers Christmas gifts in the name of the incarcerated parent. Faith is a mission-minded church located at 101 E. South St. in Arcanum. Church service is at 10:00 a.m. All are welcome to attend. The Greenville Church of the Brethren, 421 Central Ave., invites everyone to Christmas Eve services on December 24 at 8:00 PM. 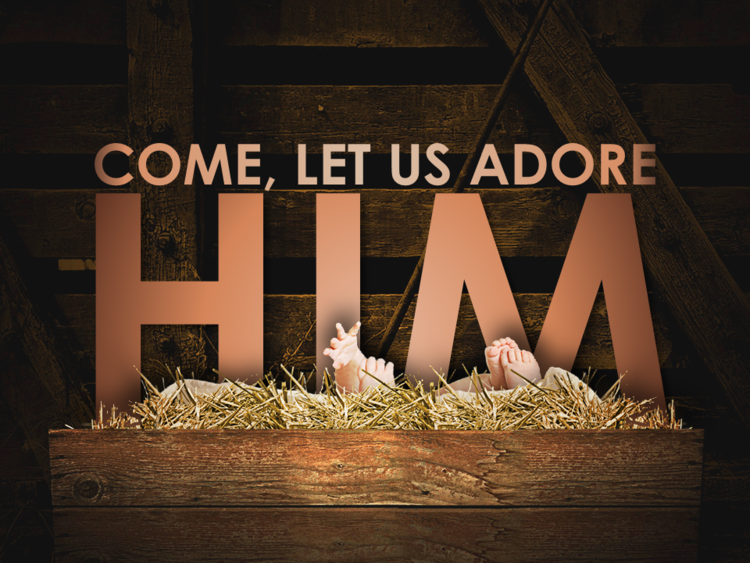 This special service entitled “ Come Let Us Adore Him” focuses attention on the Savior. The service includes a participatory sharing of the Christmas story along with the singing of carols, candle lighting and celebrating, Communion. Please come to worshipfully adore Jesus. A nursery is available. Contact 937-548-3583 for more information. with winning essay writers Mitch Bolin and Heidi Bundy. 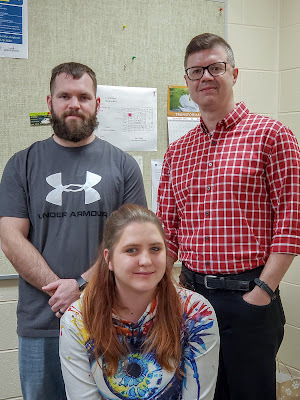 At a time of discord in the nation, Edison State Community College continues to encourage its students to write essays in which they explore their personal challenges in coming to peace and reconciliation with obstacles they have faced. Held in conjunction with the annual Dayton Literary Peace Prize celebration of the end of the war in Bosnia in 1995, Edison State student writers this year have explored a variety of topics ranging from immigration to America to family conflicts to suicide. Bolin, 32, of Piqua, is the father of a four-year-old son and is an integration lab technician at Emerson. He is majoring electro-mechanical engineering. Third place winner Bundy, 23, is from Sidney and is taking prerequisites and plans to seek admission to the Registered Nursing program at Edison State. L to R Steven, Christine, Blaine and Mike; members of Blaine Bowman and HIS Goodtime Band are all set to perform Sat. Dec. 15 at the Gospel Music Center. “God’s idea of a good time,” is how Blaine Bowman describes his programs. Blaine will be bringing HIS group to the Gospel Music Center at 340 N. Howard Street in Union City, Indiana on Dec. 15 at 7 p.m. There is no admission charge. A love offering will be taken. Blaine has shared the gospel in word and song at over 160 venues this year. Blaine will go anywhere and everywhere from his annual “Party at the Ranch” to Car Shows, City Parks, to Biker Events, Special Church Events and a festival in Florida that drew 1500 people. Blaine can be reached: P.O. Box 100, South Lebanon, Ohio 45065. Phone: 513-479-6700 or blainebowman.com or email at: treemendus1@msn.com. Blaine Bowman’s group is a very family oriented group performing with his wife Christine, grown children, spouses, and grandchildren soon to be growing into the group. The Christmas season is a time for parties and get-togethers so plan to join us on the Dec.15 at the Gospel Music Center (former First Presbyterian Church) at the corner of N. Howard and Hickory St. in Union City Indiana. For more information phone: 937-423-6335 or 937-467-9305; email terryandraine@gospelmusiccenter.com; gospelmusicenter.com. Everyone is invited to join us for a fun evening of “making a Joyful Noise”. Our next program will be Joelle York on Dec. 20, a Thursday evening, so plan to join us for an evening of beautifully sung Christmas carols. The Instrumental Music Department of Greenville Senior High School will present its annual Sounds of the Season concert on Thursday, December 13th at 7pm at Memorial Hall. The concert is free and open to the public. The Sounds of the Season Concert will feature the Jazz Scene, Symphonic Band, Wind Symphony and Orchestra. The Jazz Scene will feature music of the season by performing Big Noise from the North Pole, It’s the Holiday Season, And the Kings Shall Swing and All I Want for Christmas is You. The Symphonic Band will perform A Magnificent Christmas, Canon for Christmas and Christmas Time with Charlie Brown. The Wind Symphony will perform Christmas Festival, Adventum and Sleigh Ride. The Orchestra will close the show with Wizards in Winter, Jingle Bells, Christmas Pipes, Cantique De Noel and Christmas Eve Sarajevo12/24. The Greenville High School Concert Choir will join the Orchestra for the traditional performance of the Hallelujah Chorus from Handel’s Messiah. This wonderful Sounds of the Season concert will begin at 7pm on Thursday, December 13th at Memorial Hall and is free and open to the public. Please consider spending some time with these fine high school musicians and hearing some great holiday music. MARIA STEIN, Ohio (December 6, 2018) – On Sunday December 2nd, over 80 children and their families met in the Adoration Chapel at Maria Stein Shrine for a special visit from St. Nicholas. He shared details about his life and how his generosity mirrored that of Jesus’s self-giving. He chronicled the time that he paid the dowry for three young women to get married, calmed a storm thus saving a ship full of men, and gave many gifts anonymously. Before entering the Chapel, the children left their shoes in the hallway and were excited to see St. Nicholas had left treats inside! The day continued with crafts, cookies, hot cocoa and a special appearance by renowned artist Tim Langenderfer. Tim hand-painted a portrait of St. Nicholas and the children enjoyed watching their beloved saint come to life on canvas. Tim then gave the painting away as a door prize, as well as a printed copy, to the children in attendance. The lucky winners were Joan Slonkosky (painting) and Brynn & Olivia Miller (print). The coloring contest winners were 5 years: Parker King & Jetson Thomas, 6 years: Ashlyn Chalk & Cameron Bodart, 7 years: Kamryn Schroeder & Tyler Homan, 8 years: Elizabeth Grieshop & Jackson Hoenie, 9 years: Lilly Walke & Will Rethman, 10 years: Elli Stammen & Caleb Westerheidi, 11 years: Payton DeMange & Avery Stachler, 12 years: Andrew Wuebker & Kelly Thompson. Each child received a children’s nativity set. "Hats off to the Holidays"
You will be greeted by "Hats off to the Holidays" when you visit Wayne HealthCare, 835 Sweitzer Street in Greenville. Members of the Ladybug Garden Club decorated the front lobby with special Snowmen Christmas trees. Decorating were l-r Carol Hosbrook-Cole, Shirley Linder, Amy Addis, Angela Beumer, Barbra Skinner and Mariana Ramos. Not shown was Irma Heiser. 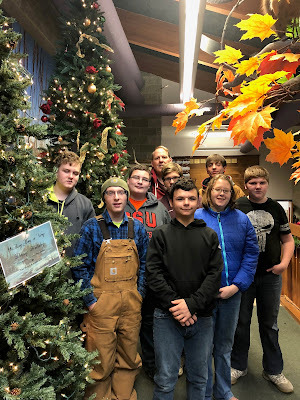 The Fish Mitten Tree once again needs donated gloves and mittens to decorate its branches; these donations will be distributed to the children enrolled in Darke County Head Start programs. 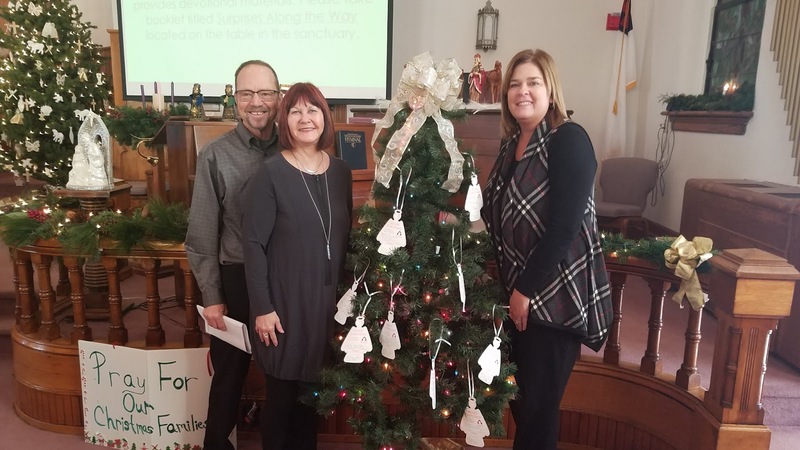 In addition to the Mitten Tree located at Montage, 525 South Broadway in Greenville, a Mitten Tree also will stand inside the Brethren Retirement Community, 750 Chestnut Street, Greenville, and in Fourman’s Variety Store, 4 West George Street, Arcanum. Many churches and organizations also erect trees which collect gloves and mittens from their members; these donations are then passed on to Fish to be given to the little Head Start participants. The Mitten Tree has been an annual holiday project of the local Fish organization for over fifty years. “The Mitten Tree provides the opportunity for people of all ages and incomes to participate in the true spirit of the season,” said Marilyn Delk, the Fish volunteer coordinating the Mitten Tree project. “We sincerely hope that our generous neighbors will once again this year be able to spare the relatively small amount required to purchase a pair of mittens or gloves and bring joy and warmth to local children who may not receive many other gifts this Christmas,” Mrs. Delk concluded. To best meet the needs of children directly served by Head Start programs, donated gloves and mittens should fit boys and girls between the ages of 3 and 5; however, donated items in larger or smaller sizes will be shared with Head Start families. So that the mittens and gloves can be distributed prior to Christmas, contributions should be made by December 19. For more information regarding the Mitten Tree, contact Mrs. Delk at 937-548-2482. Fish is an ecumenical volunteer organization which responds to emergency food needs; the Fish Choice Food Pantry, located at 400 Markwith Avenue, is open on Mondays from 1 p.m. to 2 p.m., Wednesdays from 10 a.m. until 11 a.m., and on Fridays from 4 p.m. to 5 p.m. No appointment is necessary to visit the Food Pantry; clients are eligible for help once every four weeks. For more information, call the Fish phone number, 548-2000; a volunteer will return your call. The Greenville Street Department was honored by the Ladybug Garden Club for outstanding achievement in design, maintenance of Commercial property and Community Beautification in Christmas decorating. The downtown Greenville has come alive with lighting on the traffic circle, all lamp posts, the City Building landscape, Annie Oakley Park, and this year they added special strands of snowflake garland across Broadway. All their efforts are appreciated for making the downtown outstanding. Front row Ryan Delk, supervisor Greenville Street Department, Lisa Marcum, Ladybug Community Beautification chair. Second row- Jason Howard, Chris Hunt and Wes Wirrig. Third row, Cody Nealeigh, Ethan Saylor, Jennifer Robertson and Ladybug member Angela Beumer. Back row, Matt Myers, Billy Hoyt, Jerrod Marshall and Colton Nealeigh. Not pictured is Rob Weyant, a vital contributor to the lightening. 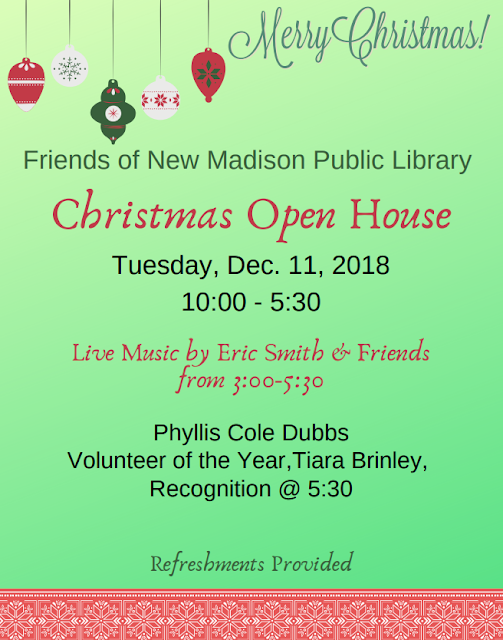 The Friends of New Madison Public Library invite you to attend their annual Christmas Open House at the Library on Tues. Dec. 11, 2018. We will celebrate throughout the day with homemade cookies and punch beginning at 10. From 3-5:30 local musicians, Eric Smith and Friends, will return with some Sounds of the Season to brighten your day. At 5:30 the Board of Trustees will be honoring our Phyllis Cole Dubbs Library Service Award Recipient for 2018, Tiara Brinley. Bring the family in to celebrate and stock up on books, magazines, movies, and music for the holiday season. Check out our website www.mynmpl.org, LIKE us on Facebook, and follow us on Pinterest for more information on programming throughout the year. 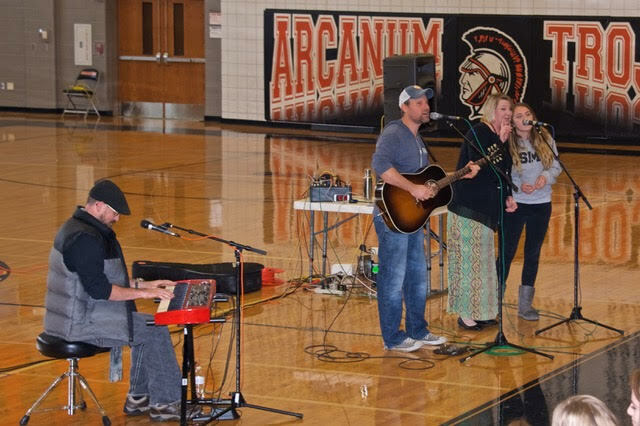 Award-winning singer/songwriters Jonathan Kingham & Ryan Shea Smith recently performed for Arcanum High School students, as part of DCCA's Arts In Education programming for Darke County High School Students. Darke County Center for the Arts recognizes Maid-Rite Sandwich Shoppe for contributing funds in support of its Arts In Education (AIE) programs. DCCA, in conjunction with school administrative staff, annually takes performing artists to every grade of all Greenville City and Darke County public schools. "DCCA thanks the Maid Rite Sandwich Shoppe and all our sponsors who make our AIE programs possible." shared Andrea Jordan, DCCA Executive Director. "We are proud to present world class professional performing artists, in our local public schools, that engage and entertain students," concluded Jordan. DCCA Arts In Education programs for 2018-2019 season include Kathakaar (grades K-3) "The Spinning Storytellers" sharing history and culture of India. Lee Murdock shares music and history of the Great Lakes (grades 4-6); Alpin Hong (grades 7 & 8) a Darke County favorite, returns bringing his own "pianistic firebrand" to St. Clair Memorial Hall; and Jonathan Kingham (grades 9-12) shares creative songwriting. In addition to performing for Junior High students, Alpin Hong was also presented as part of the DCCA Artists Series. Arts In Education artists are generally in residence for a week as they tour all of the eight public school districts in Darke County. These programs are open to the public; contact the DCCA office for more information. Most Arts In Education performers spend a week in Greenville traveling to all Greenville City and Darke County public schools, with the exception of the Jr. High program, which takes place at St. Clair Memorial Hall with students being bused in. According to Keith Rawlins, DCCA Artistic Director, “During the Artist’s residencies we always point out local landmarks to visit, with Maid-Rite Sandwich Shoppe making the list as a ‘must’ to truly experience the treasures we have in Darke County.” “The support of a local icon like Maid-Rite is greatly appreciated by DCCA and sends a powerful message to the children,” he concluded. All programs are free and open to the public. Additional Arts In Education sponsors include Bach to Rock, DP&L Company Foundation, Richard Baker, Greenville VFW Post #7262, Greenville Federal, Midmark, Gordon Orthodontics, the Wes & Patti Jetter Fund, the Mandy Green Fund, Edison State Community College, The Early Bird & Blue Bag Media, Littman-Thomas Agency, and Wayne Health Care. DCCA also receives local support from the John R. and Miriam H. Knick Fund of the Darke County Foundation, The Ketrow Foundation, Lydia E. Schaurer Memorial Trust, Harry D. Stephens Memorial, and DCCA memberships, as well as funding from the Ohio Arts Council, the state agency that funds and supports quality arts experiences to strengthen Ohio communities culturally, educationally, and economically. Darke County Center for the Arts presents and promotes performing and fine art encouraging cultural enrichment. For more information on DCCA programs call DCCA at 937-547-0908 or visit their web-site at www.DarkeCountyArts.org. November turned out to be eventful in the Commissioner’s office. This month saw us get a handle on the budget for next year. Thanks to the conservative hard work of our elected officials along with the Commissioner’s Office we will have a balanced budget for 2019. This budget issue was the fault of none of our officials, nor the Commissioners; this was a revenue loss from the State, along with increased demands for other mandates. With the new administration, these problems can be solved in the future. We have met the new Governor and Lt. Governor and expressed our concerns, along with the County Commissioner’s Association (C.C.A.0. ), and it seems very hopeful a new era of co-operation can be reached. The Courthouse security issue is closer to being resolved, we hope. We have all agreed that one entrance only is the preferred way to secure the Courthouse. We have come up with a plan to do just that, and that will mean closing the front steps and back door to the public, using them for emergency exit only, and having a new entrance in the front that is handicap accessible. The front steps will remain the same for the time being, and in the near future, we will hopefully be able to do a proper set for the front of the Courthouse. Now that November has come and gone, and by now we should all be out of our turkey coma, it is time to get back to a regular routine until Christmas. While you are out shopping or just looking around, you may stop in any Monday or Wednesday at 1:30 p.m. at the Commissioner’s office in downtown Greenville and catch one of our open public sessions. We are located at 520 South Broadway, just south of the Courthouse. The inspiration for this year’s theme stems from the 2009 drama “Taking Chance,” which was based on the experiences of U.S. Marine Lt. Colonel Michael Strobl, who escorted the body of a fallen Marine, PFC Chance Phelps back to his hometown in Wyoming from the Iraq War. Fort GreeneVille Chapter Daughters of the American Revolution and the Greenville Union Cemetery would like to invite everyone to the Wreaths Across America event. This is the first year that the cemetery is having this honorable event and planning for many years to come. The local ceremony will begin at noon at the Greenville Union Cemetery mausoleum and Soldiers section. Local Veterans will be representing their branches of service: Chris Rehmert-Army, Charles Shields-Marine, Elaine Harter-Air Force, Kevin Shuttleworth-Coast Guard, Dean Delk-Navy, Stephen Eldred-Merchant Marines, along with Starranne Wise, Army, playing taps. National Wreaths Across America Day, will take place this year on Saturday, Dec. 15, 2018. 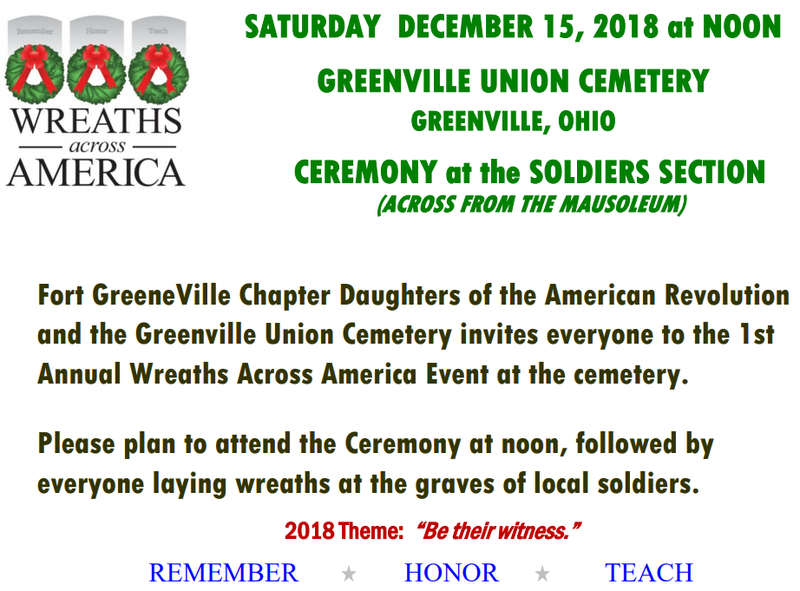 At Greenville Union Cemetery, the event will be at noon and more information can be found at https://www.facebook.com/fortgreenevilledar/. In 2017, more than 1.5 million veteran wreaths were placed on headstones at 1,422 participating cemeteries around the country in honor of the service and sacrifices made for our freedoms, with each name said out loud. National Wreaths Across America Day is a free event and open to all people. For more information on Wreaths Across America, please visit www.wreathsacrossamerica.org. Darke County Farmers Union will have its Annual Meeting (116th Anniversary year) on Tuesday evening, Dec. 18th, 6:30 PM, at J.T.’s Brew and Grill restaurant in Greenville. Dinner will be partially paid for by the Local and will commence at 6:30 PM with the program to start at 7:15. The featured speaker will be Greg McGlinch, OSU Graduate Research Assoc., who will present a program on barley production. There will be an election of officers this year, and a selection of delegates to the OFU State Convention. Farm policy, health insurance, and other items will be discussed and a door prize will be given away. Join us for our annual holiday cookie extravaganza on Saturday December 8th from 10:00 a.m to 2:00 p.m. at the Greenville Public Library. As always there will be tables full of delicious cookies, punch, and coffee, plus live music provided by a string quartet and flutist Nancy Jackson. Santa and Mrs. Claus will also be attending! Kids can get their picture taken with them for free. The Friends will also have many beautiful Christmas books available at their Continuous Booksale in the Computer Room of the Library. They have quality books of all genres so be sure to shop gifts for yourself or others on your list. Or stock up for those cold winter nights ahead. 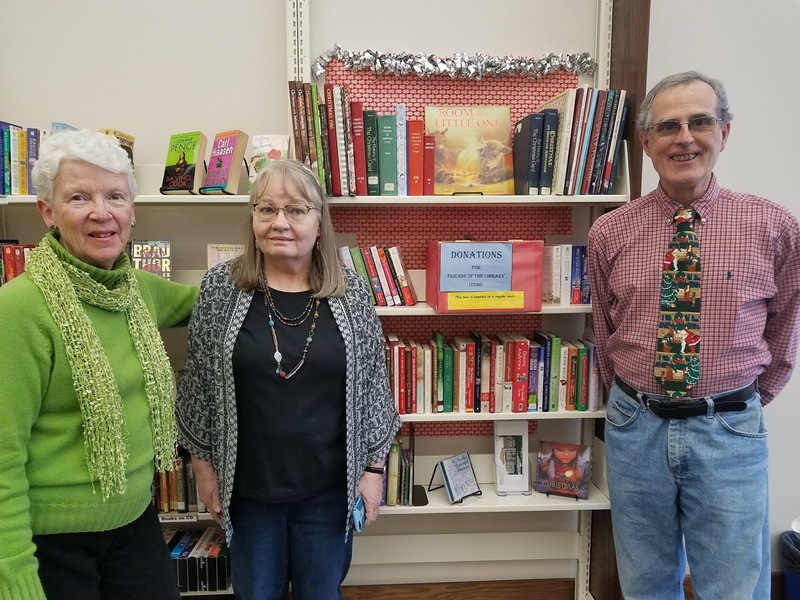 The Friends are a volunteer group who raises money for the benefit of the Library. They sponsor the Summer Reading program including the entertainment for Family Fun Day each year as well as purchase expensive items outside the budget. Recently they bought a portable stage and additional puppets for the GPL Puppeteers. Seen left are Carolyn Fisher, President Vicky Stickel, and Treasurer Craig Stickel, by the Christmas book display. 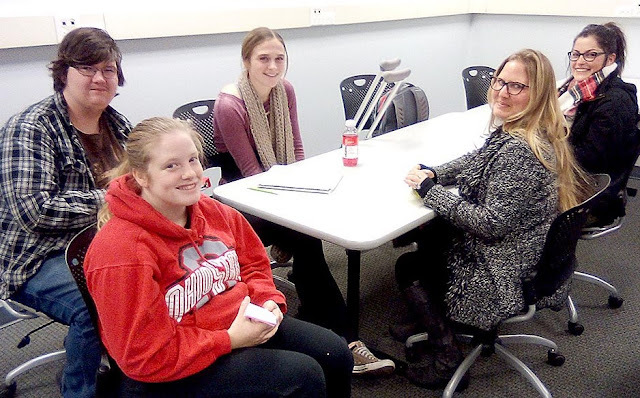 Five “Fundamentals of Communication” students at Edison State Community College, Darke County Campus, will offer a presentation addressing the issues of bullying on Tuesday December 11th at 6:30 p.m. at the Greenville Public Library. Dawn Cleere, Hope Byrum, Baylee Petry, Renee Netzley and Christopher Bucklew will talk about the different types of bullying, its impact on victims and different ways to address the problem. The program is a culmination of 16 weeks of preparation in public speaking, research, and teamwork. While statistics may vary somewhat, all sources agree bullying is a major problem in the U.S. For instance, one national anti-bullying site reports that 90 percent of fourth through eighth graders report being victims of bullying, with over 3.2 million victims reported every year. Approximately 160,000 teens skip school daily due to bullying, and one in 10 will eventually drop out of school. Surveys done in three Edison State communications classrooms indicate nearly two-thirds of the students have been bullied, about a third have actually participated in bullying and almost without exception students have observed bullying (referred to as bystanders). In addition to the library presentation, six other Edison State communications teams have been invited to Greenville Middle School and Ansonia Local Schools to talk with students, first through eighth grades, about the harmful effects of bullying. Their focus will be directed to the students, while the library program will be directed toward adults and students. What are the harmful effects of bullying? Why does it happen? What can victims and bystanders do about it? These are just a few of the questions the Edison State team hopes to address. Registration is not required.